Please see our player page for Trevor Bauer to see projections for today, the next 7 days and rest of season as well as stats and gamelogs designed with the fantasy baseball player in mind. Do you ever get the urge to sip on some syrup, Super Troopers style? Maybe is just me or I’m in the mood for breakfast. Whelp, we’re way off topic now, guess it’s time to bring up James Paxton, who is currently priced at $10,600 .“Big Maple” is one of the top options of the day at pitcher. He’s got more than enough talent to handle facing the O’s again for the second time in a week. Camden Yards favors power, but let’s trust in Paxton’s ability. I feel good about the Yankees offense backing him up a bit more and getting him a win with some good strikeout upside. Bring it on. 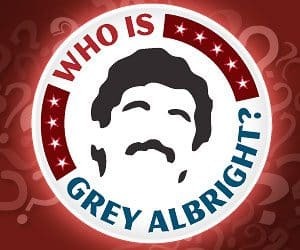 Said like Ron Burgundy, “That’s not English.” Should there be more than one? 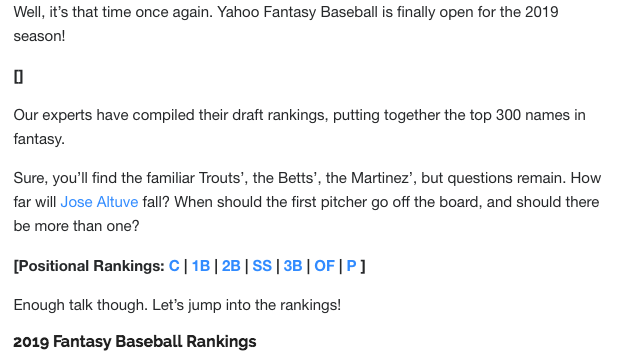 Are Yahoo leagues this year one-pitcher leagues? I’m so confused. Did 100 monkeys with 100 typewriters, who only read Bleacher Report, write up this intro? Ha! Was there enough talk? I’ve written more in this intro than they wrote. With that level of effort, they don’t even deserve this evisceration, but… *sharpens nails that look like the 108-year-old Asian man in the Guinness Book of World Records* …here goes nothing. 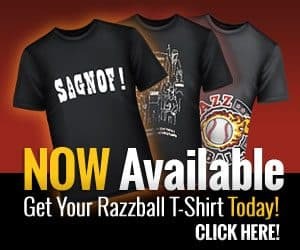 For this post, I will be looking at the consensus Yahoo 2019 fantasy baseball rankings vs. my own 2019 fantasy baseball rankings.